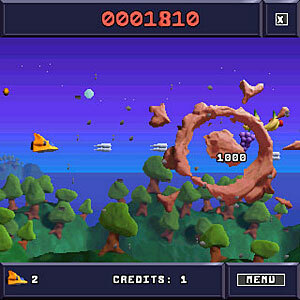 Released last week, Astraware's Platypus shoot'em up game has already proved a button-straining hit on our handheld. 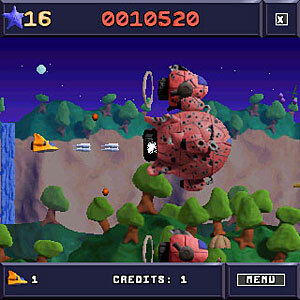 The sideways scrolling, arcade-style shooter has a lovely retro feel to do it, with graphics created using claymation-style effects, giving the game a fun, sci-fi, Aardman-esque look. The game follows the usual shoot 'em up tradition of putting the user in control of a spaceship that has to blast the chuffing heck out of anything that comes its way. Irritating little ships can be swatted with a single missile, while bigger objects need more hits to finish them off, with a satisfying clay 'splodge' appearing once they're blasted out of the sky. Enemy ships come in all shapes and sizes, with some of the eccentric creations bringing a smile to your face. There's also falling fruit bonuses to collect and armoury boosting, coloured star power-ups, dishing up satisfyingly lethal weapon upgrades like double speed gunfire and sonic waves. The graphics and animation were fast, smooth as silk and fun on our Palm Centro, with the multi-layered scrolling backgrounds giving a real depth to the graphics. Fans of classic Commodore 64 games might also enjoy the soundtrack which will take you straight back to those vintage gaming days. Packing four clay worlds and 20 levels of 'squishy side-scrolling fun,' Platypus is a whole load of fun and an impressively well put together game for a handheld. We've had a whole load of fun with the game, and can thoroughly recommend it. Platypus can be downloaded for $19.95 at Astraware.com and is available on the Palm OS, Pocket PC and Windows Mobile Smartphone platforms.